Marin County is a county located in the North San Francisco Bay Area of the State of California. As of the 2010 census, the population was 252,409. Its county seat is San Rafael. Marin County is included in the San Francisco-Oakland-Hayward, CA Metropolitan Statistical Area. It is across the Golden Gate Bridge from San Francisco. Marin County is well known for its natural beauty, liberal politics, and affluence. 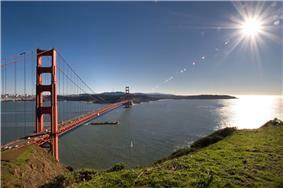 In May 2009, Marin County had the fifth highest income per capita in the United States at about $91,480. The county is governed by the Marin County Board of Supervisors. Skywalker Ranch. Autodesk, the publisher of AutoCAD, is also located there, as well as numerous other high-tech companies. The Marin County Civic Center was designed by Frank Lloyd Wright and draws thousands of visitors a year to guided tours of its arch and atrium design. In 1994, a new county jail facility was embedded into the hillside nearby. Marin County's natural sites include the Muir Woods redwood forest, the Marin Headlands, Stinson Beach, the Point Reyes National Seashore, and Mount Tamalpais. In 1595 Sebastian Cermeno lost his ship, the San Agustin, while exploring the Marin Coast. The Spanish explorer Vizcaíno landed about twenty years after Drake in what is now called Drakes Bay. However the first Spanish settlement in Marin was not established until 1817 when Mission San Rafael Arcángel was founded partly in response to the Russian-built Fort Ross to the north in what is now Sonoma County. Mission San Rafael Arcángel was founded in what is now downtown San Rafael as the 20th Spanish mission in the colonial Mexican province of Alta California by four priests, Father Narciso Duran from Mission San Jose, Father Abella from Mission San Francisco de Asís, Father Gil y Taboada and Father Mariano Payeras, the President of the Missions, on December 14, 1817, four years before Mexico gained independence from Spain. 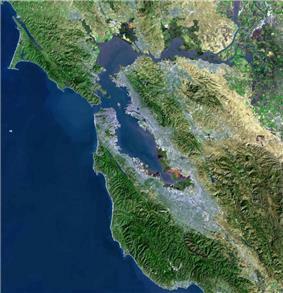 Notable features of the shoreline along the San Francisco Bay include the Sausalito shoreline, Richardson Bay, the Tiburon Peninsula, Ring Mountain. and Triangle Marsh at Corte Madera. 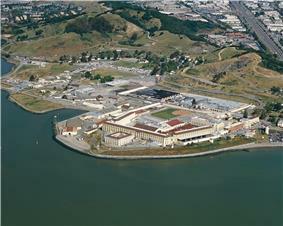 Further north lies San Quentin State Prison along the San Rafael shoreline. Notably, the Lagunitas Creek Watershed is home to the largest-remaining wild run of Coho salmon (Oncorhynchus kisutch) in Central California. These coho are part of the "Central California Coast Evolutionarily Significant Unit," or CCC ESU, and are listed as "endangered" at both the state and federal level. Significant efforts to protect and restore these fish have been underway in the Watershed since the 1980s. Fifty-percent of historical salmon habitat is now behind dams. Strong efforts are also being made to protect and restore undammed, headwater reaches of this Watershed in the San Geronimo Valley, where upwards of 40% of the Lagunitas salmon spawn each year and where as much as 1/3 of the juvenile salmon (or fry) spend their entire freshwater lives. The "Salmon Protection and Watershed Network" leads winter tours for the public to learn about and view these spawning salmon, and also leads year-round opportunities for the public to get involved in stream restoration, monitoring spawning and smolt outmigration, juvenile fish rescue and relocation in the summer, and advocacy and policy development. Around 490 different species of birds have been observed in Marin County. In the county the population was spread out with 20.3% under the age of 18, 5.5% from 18 to 24, 31.0% from 25 to 44, 29.7% from 45 to 64, and 13.5% who were 65 years of age or older. The median age was 41 years. For every 100 females there were 98.2 males. For every 100 females age 18 and over, there were 96.4 males. According to the 2006–2008 American Community Survey, 81.3% of Marin County's residents were native to the United States. Approximately 80.0% of the county's residents were born in one of the fifty states or born abroad to American parents. Foreign-born individuals made up the remaining 18.7% of the population. Latin America was the most common birthplace of foreign-born residents; those born in Latin America made up the plurality (42.2%) of Marin County's foreign population. Individuals born in Europe were the second largest foreign-born group; they made up 25.3% of Marin County's foreign population. Immigrants from Asia comprised 23.7% of the county's foreign population. Those born in other parts of North America and Africa made up 3.9% and 3.8% of the foreign-born populace respectively. Lastly, residents born in Oceania made up a mere 1.2% of Marin County's foreign population. For most of the 20th century, Marin County tended to vote Republican. From 1948 to 1980, the only Democrat to win there was Lyndon Johnson in 1964. However, the brand of Republicanism prevailing in Marin County was historically a moderate one. Like most of the historically Republican suburbs of the Bay Area, it became friendlier to Democrats as the GOP moved rightward nationally. In 1984, it narrowly voted for Walter Mondale and has supported the Democratic candidate in every presidential election since then. Since the 1990s, it has become one of the Democrats' major strongholds in both California and the nation. Out of California counties, only San Francisco County and Alameda County voted more Democratic in the 2008 Presidential election, all three counties voted more heavily for Democratic Presidential candidate Barack Obama than Cook County, Illinois, Obama's home county. Marin has been slightly more competitive when voting for governor. In 2006 Arnold Schwarzenegger lost the county by just under 2,000 votes. Marin has voted for many gubernatorial candidates who went on to become high profile national figures including Richard Nixon, Ronald Reagan, Jerry Brown, and Dianne Feinstein. According to the California Secretary of State, as of October 22, 2012, Marin County has 155,025 registered voters, out of 176,604 eligible (87.78%). Of those, 84,374 (54.43%) are registered Democrats, 28,458 (18.36%) are registered Republicans, 7,000 (4.51%) are registered with other political parties, and 35,193 (22.70%) have declined to state a political party. Democrats hold wide voter-registration majorities in all political subdivisions in Marin County, except for the affluent city of Belvedere, in which Democrats only hold a 60-vote (3.95%) registration advantage. Democrats' largest registration advantage in Marin is in the town of Fairfax, wherein there are only 391 Republicans (7.2%) out of 5,441 total voters compared to 3,496 Democrats (64.25%) and 1,145 voters who have declined to state a political party (21.04%). In 2002, former U.S. President John Walker Lindh as "some misguided Marin County hot-tubber," as a reference to the county's liberal, "hippie" political culture. Outraged by the label, some local residents wrote scathing letters to the Marin Independent Journal, complaining of Bush's remarks. In response, Bush wrote a letter to readers in the same newspaper, admitting regret and promising to not use the phrases Marin County and hot tub "in the same sentence again." Bicentennial Campground within the Golden Gate National Recreation Area surrounding the San Francisco Bay area. Marin County Airport or Gnoss Field (ICAO: KDVO) is a general aviation airport operated by the County Department of Public Works. The nearest airports with commercial flights are San Francisco International Airport and Oakland International Airport as well as Charles M. Schulz - Sonoma County Airport north of Marin County. 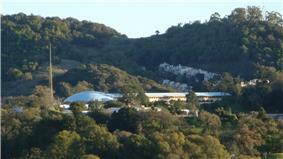 College of Marin, established in 1926, includes two campuses. The Kentfield Campus is located on 77 acres in Central Marin; the Indian Valley Campus is located on 333 acres in North Marin. The College offers more than 40 degree programs leading to an Associate of Arts or Associate of Science degree and over 20 Certificates of Achievement with various specialties. The College serves approximately 9,000 students each term. Approximately 5,700 students enroll in COM’s credit program. About 1,300 students enroll in English as a Second Language classes. Approximately 1,900 enroll in community education classes. The College employs about 300 permanent staff and faculty and many part-time employees. West Marin Citizen, a weekly newspaper. Marin County lifestyles of the 1970s were spoofed in The Serial: A Year in the Life of Marin County by Cyra McFadden and in Serial, which was based on the novel. The Body Snatchers was set in Mill Valley. Key scenes in the 1973 movie American Graffiti were filmed in Marin at Tamalpais High School and on 4th Street in downtown San Rafael. Scenes from The Godfather and The Godfather: Part II were filmed in Marin. Marin County's reputation as a counterculture enclave, especially the town of Bolinas and its isolationist reputation, made it a location of many key events in Ecotopia Emerging by Ernest Callenbach. Many scenes of the Dirty Harry franchise were filmed in Marin. Village of the Damned was filmed entirely in Marin. Jack was filmed almost entirely in Ross. Bandits was filmed in Marin. Gattaca was filmed at the Marin County Civic Center. Scenes from THX 1138 were filmed at the Marin County Civic Center. 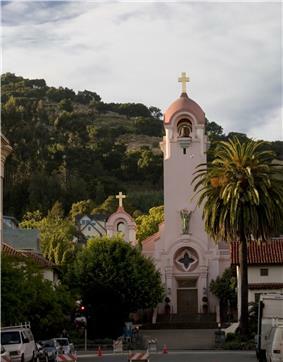 In Raiders of the Lost Ark, the college scenes were filmed at Dominican University of California; additionally, home exteriors were filmed in San Rafael. In Youth in Revolt: The Journals of Nick Twisp, the Twisp family resides in Oakland and Nick's father is in jail in Marin County. A Time For Dancing was set in Mill Valley and the characters attended Tamalpais High School. Scenes in Basic Instinct were filmed in Marin, particularly the car chase scene when Nick Curran (Michael Douglas) follows Catherine Trammell (Sharon Stone) from Mill Valley to Muir Beach on Highway 1. In Foul Play, Tony Carlson (Chevy Chase) lives on a houseboat in Sausalito. Short scenes in Nine Months were set in Tiburon, along with a view of San Francisco. Short scenes in Zodiac were filmed in and around Marin County. It should be noted that the stabbing scene at the lake was not filmed in Novato, but at Lake Berryessa. The staging of George Grisby's shooting in The Lady From Shanghai was shot on the dock outside what is now the Gaylord Indian Restaurant in Sausalito. In M*A*S*H, B.J. Hunnicut (Mike Farrell) was from Mill Valley in Marin County. Much of Radio Flyer was filmed in Novato (other portions were filmed in Sonora, California). The Moneytree was set in Marin County. Segments from Funny People were filmed in Marin County. Several scenes in Mother were shot in Kentfield, Larkspur, Sausalito, and other areas of Marin. Some scenes in Star Wars Episode VI: Return of the Jedi were filmed in Marin County. In Terminator Salvation, Skynet's California headquarters is presumably located in Marin County. In Star Trek IV: The Voyage Home, Kirk and Spock find their humpbacked whales in the "Cetacean Institute" supposedly situated in Sausalito. Star Trek: The Next Generation places Starfleet Academy in what is now Fort Baker, immediately south of Sausalito. Half of Blood In Blood Out was filmed inside California's San Quentin State Prison. Both in the novel and 1998 film, Stella in How Stella Got Her Groove Back was from Marin County. Mount Tamalpais in the Marin Hills serves as the home of the Greek Titans in Percy Jackson & the Olympians. In The Ted Knight Show, Henry and Muriel Rush and Monroe Ficus move from San Francisco to Marin County. Touching Home is directed by Noah and Logan Miller, twin brothers from Marin County. Parts of The Years of Rice and Salt take place in an alternate Marin County colonized by Ming-dynasty China. Parts of Tupac: Resurrection were filmed in Marin City. 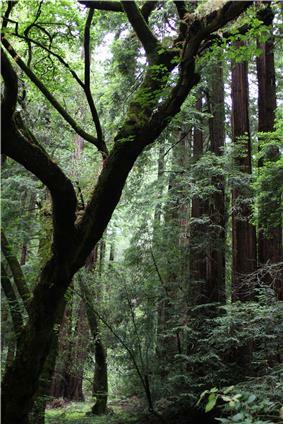 Parts of Rise of the Planet of the Apes and Dawn of the Planet of the Apes take place in Marin County and Muir Woods. ^ a b c d e f g h i j k l m n o p q California Secretary of State. February 10, 2013 - Report of Registration. Retrieved October 31, 2013. ^ San Francisco Department of Elections. Election Summary: November 4, 2008.